Today, there is some potentially exciting “news” about Google and Chromebooks. Without diving too far into the back story, let’s talk about the actual video and then we will discuss how it came to be leaked to the Internet. In this video, a narrator (that we wish was Morgan Freeman), discusses pixels and their importance to anything image-related. Now, imagine a Chromebook that featured a touchscreen display with a resolution of 2560 x 1700. Too good to be true, right? Maybe or maybe, not. No one has been able to confirm if this is real or not. 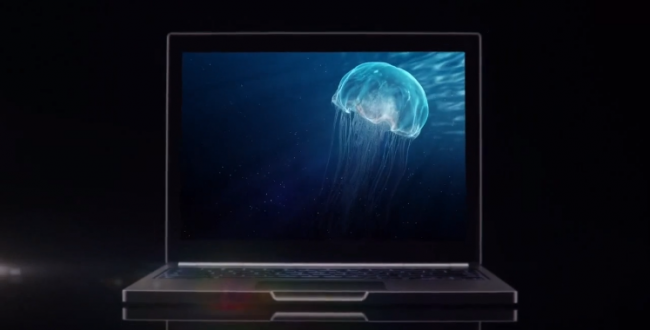 It is referred to in the video as the Chromebook Pixel. Think of this device as a Nexus-like Chromebook, designed and manufactured entirely by Google, “down to the last pixel.” It is quite the video, which someone clearly spent a ton of time working on. From what we can tell, this isn’t your everyday sloppy leaked video. So, how did it come to light? According to the CEO of the website, Slinky.Me, the video was stolen after their servers were “hacked.” Interestingly enough, some are speculating that this is some type of hypebeasting move by either Slinky or even Google to get people excited for what is next in the Chromebook department. Watch the video and let us know what you think. If this thing ever becomes real, I might just have to be the first in line. Needless to say, it’s gorgeous.